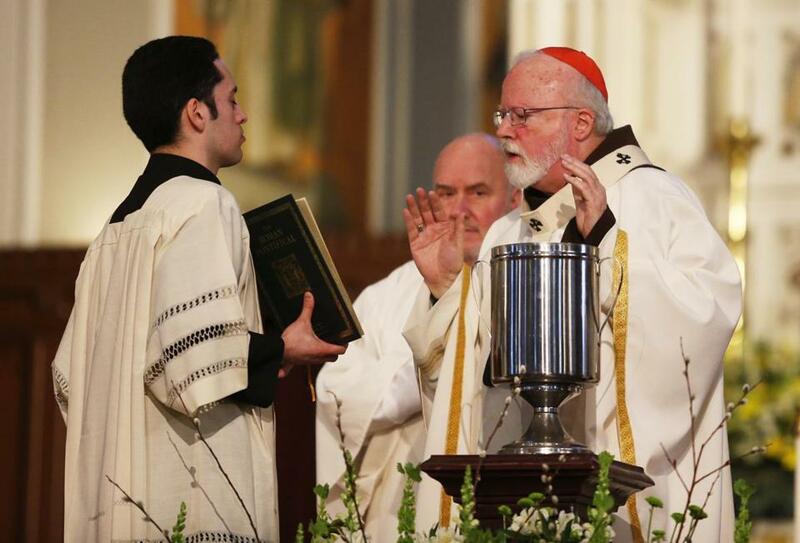 Cardinal Sean O&apos;Malley presided over the Chrism Mass at the Cathedral of the Holy Cross on Tuesday. O’Malley, archbishop of Boston and a close adviser to Pope Francis, did not mention the pontiff’s remarks to a German newspaper last month indicating some openness to the possibility of married priests in regions suffering from a severe shortage of priests. While Francis said allowing priests to marry isn’t the answer to the priest shortage, his statements still sparked debate about the Roman Catholic Church’s celibacy requirement for priests. The Archdiocese of Boston has about 600 priests available for parish ministry today compared with about 1,500 in the 1960s, though the archdiocese has fewer parishes. St. John’s Seminary, however, is at capacity now, an archdiocesan spokesman said, because of the emphasis O’Malley has placed on attracting more priests. O’Malley urged clergy to spend time with one another, to put aside their differences — “remember, we don’t have to be twins to be brothers” — and to work hard to ensure the church’s future. “Never miss an opportunity to invite a young man — or a not-so-young man — to consider a priestly calling,” he said.